Please log-in to the NYC Chapter website by using the same log-in information from the National website. Please enter the username and password below. If you have forgotten your log-in information please click here to reset your password or to find your username. For new NYC chapter members, please allow 24hrs for the data from national to upload to our website. NASW NYC chapter members, please do not click on the "click here to register", instead click on forget your password to find you log in information. (creating a new account will cause a glitch in the database) If you live in the five boroughs, chances are that you are an NYC member. 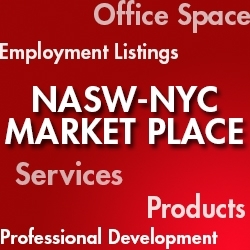 If you are a NASW member, but not a NYC chapter member please click, "click here to register", and register as a "NASW Member of a Different Chapter". Please allow a reasonable time for us to approve the account. If the account has a NYC address it will be deleted because will cause a glitch in the database.